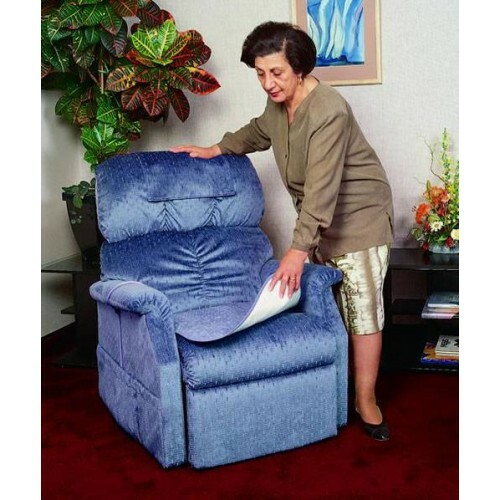 Deluxe, waterproof chair pad protects furniture and wheelchair seats. Offers four layers of protection. 100% stay-dry surface is soft and comfortable on skin, while protecting from wetness. Bound edges for longer life, even after multiple washings. Fabric information: Surface: 100% nylon Inner Lining: 100% polyester Backing: 100% vinyl backed polyester Soaker: 65/35 polyester rayon Size: 21" X 22". Keeps chair clean, dry and looking new. Ideal for chairs, cars & wheelchairs. Protects sensitive skin from moisture. Absorbent inner layer and vinyl backing shields seating surface from fluid damage and soiling. Cuts down on the need for costly professional steam cleaning. Absorbs up to one cup. Machine washable and dryable. These pads saved me from having to discard my husband's favorite recliner. In fact,,Imwillmorder more! I decided to flip the pad and go lengthwise instead of from head to toe. It doesn't move as much and has saved me washing sheets several times a week. Would recommend to anyone. I highly recommend these quilted pads. 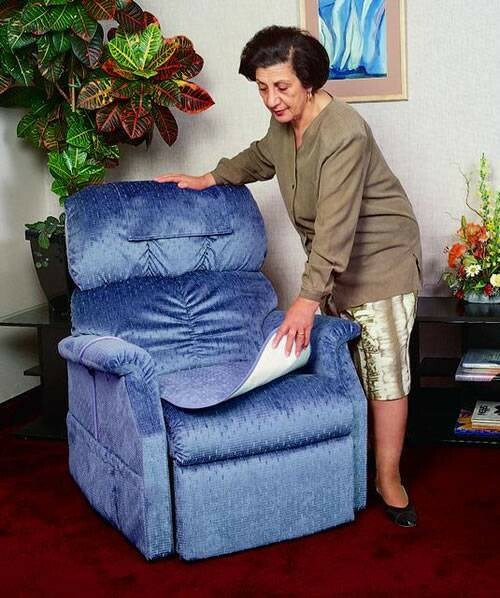 picture represented a thicker larger cover for a chair. product was a pad the was very thin and smaller than expected. I like this because it is a dark color instead of white which is what I found at all other websites. Thank you!!!! I bought this for my dad. He has a couch in his room at the care facility and as I know he loves that couch (he bought it for his house 8 years ago), he always sit on it. He's incontinence spoiled the color of the couch and we had to wash the whole couch which, we know will damage it. So I bought him this underpad, in green as his couch is dark green. I told the attendants to check it and wash it every now and then for dad. I have to sit down for more than 8 hours per day and it caused me to have severe pain. My daughter got me this and now I can be far more comfortable while working. I love the softness of this pad. Even after washing it with machine it was still fine. Guess there must be a lot of people who have to sit on their chairs for hours in a day. It will be great help for you guys too!